My first job was at Harahan’s Laundry. Then I completed my double masters in accounting and computing at Charles Sturt University and am now working as admin manager in a small company. I am also President of the Indian Association in this area. 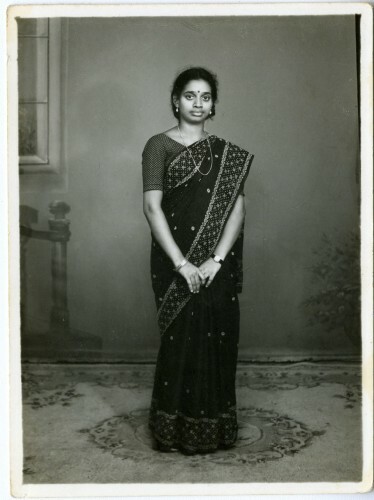 My name is Padma Ayyagari. I was born in Hyderabad in India, which is the capital city of the state of Andhra Pradesh which is south of India. I was raised there, went to college and did my undergraduate degree over there and then half way through the studies got married. Marriage moved me from one mega city to another mega mega city, which is Bombay now it’s called Mumbai. My father-in-law decided we should all move to where the business is. He [father-in-law] started a poultry farm, which is a chook farm. I didn’t know anything about chooks until then, neither did my husband. He went and did training in a hatchery somewhere else for six weeks, and I pretty much learnt on the job, how to raise day old chooks to eight weeks to their culling season. My husband liked the idea and he said, ‘I would like to go.’ And I said, ‘Really there is no need for that, who is going to manage all this, parents are getting older, we will think about it.’ My brother-in-law came back here [Australia] and he actually lodged the application for migration. At that time there used to be the visa provisions for family reunion. In 1988 January we got our visa granted and we had about three months to leave the country. So 1988 March 12 we left India on Alitalia Airlines. It was coming from Rome [to] Mumbai [then to] Melbourne. We came with two suitcases, two children. All the spare change in our pockets would have amounted to $40 probably converted. And the tickets and all were organised by my brother-in-law from here [Australia] to India. We probably had about a couple thousand dollars debt, that’s our start in Australia. We landed in Melbourne about 5 o’clock. It was cold, rainy, so coming from there [India] the cold and the lack of people and the quietness … I was used to the quietness but it was a different kind of quiet. It was all quite a shock. The next step for us was to settle in as quickly as possible and find jobs so we could get up on our feet and pay this debt back and start our life basically. 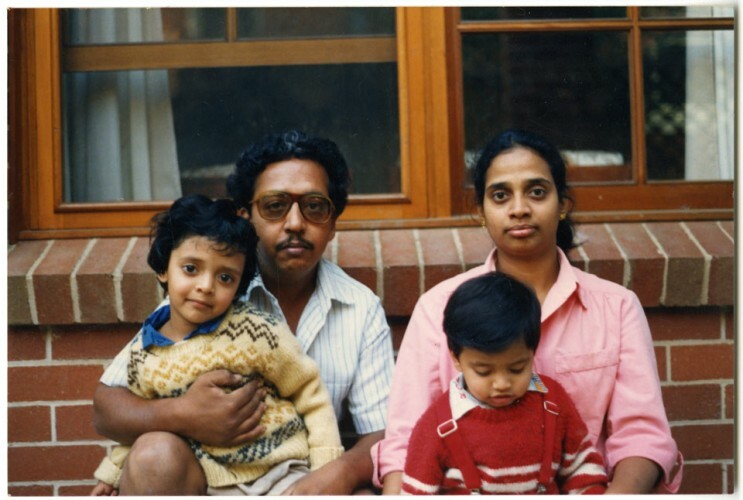 Padma with her husband and two oldest children outside their first home in Albury, 1989. The very first job that my husband had was delivering pamphlets up on Forest Hill on a bicycle. We were business people back in India. We had people working for us. My very first job [was] two months after, when I first started looking ‒ it took me that long to settle in with the kids. It was funny with the kids too, neither of them knew any English. They could only speak our mother tongue, which is Telugu, and a bit of Hindi they could understand, which is the national language, but neither of them knew a word of English. They have two cousins about the same age and they didn’t know any other language than English because they were born here [Australia]. So the priority was for the kids to learn English because my daughter was ready to start pre-school. And so we were all talking to them in English and it took them about six weeks to pick up. Then I started looking for jobs and I started walking around knocking on doors. I thought whatever job comes, I’ll grab it. So I walked into this Harahan’s Laundry and asked if I could start, if there is any work. The supervisor said, ‘Yes you can start Monday.’ That was a shock that I could actually get a job, I did not know what the job was. So here I was on Monday morning at the laundry, coming from a background of having maids at home. I never had to wash a handkerchief in my life. At the farm I had five maids I could call on to do the housework. Cooking I used to do, but washing dishes and clothes and all that, I had maids to do. So my very first job was feeding the wet pillow cases through this mangle that get ironed and come out on the other side where the ladies on the other side fold it. So the trolley is about that high [1.5 m] full of tight balls of wet pillow cases. Pick up one, shake, feed, pick up one, shake, feed, eight hours on my feet. I never did anything manual until then. It was quite a shock. Before the job a decision had to be made by me about my dress code. 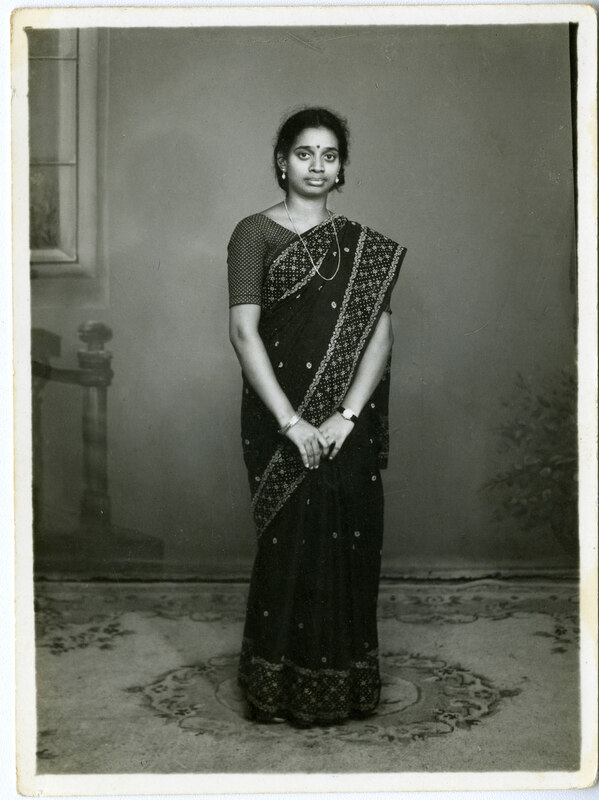 I was dressing in traditional Indian like I am now, but to get a job I had to change. Especially working in the Australian environment, I had to wear western clothes. And when I started this job I changed into western clothes. I took off all of my [Indian clothes]. I was like a walking fire engine, cling clang, cling clang, all these bangles, anklets, and necklaces clanging and this big red dot and Indian clothes. 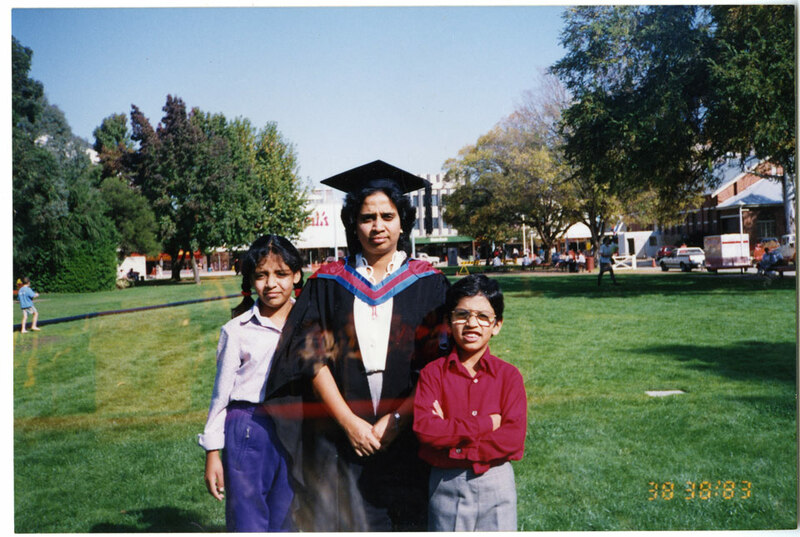 We were the fifth Indian family to migrate into Albury at that stage. That was my first job, that was good. And then I went and enrolled at Charles Sturt University, starting from 1989, to do a double major in accounting and computing. I have to say, you work hard but you would see results here faster than in India. We were very very happy and very settled and we moved in [to our house] on the 1st. My philosophy always had been, you start, things will fall into place. You don’t wait for things to fall into place for you to start something. That always worked for me. There’s a way of the universe providing for you if you are courageous enough to take that first step. It goes for our migrating here, it goes for our job finding, it goes for my babysitting ‒ every step of the way throughout my life until now that philosophy helped a lot. In 1993 April I graduated and then in 1993 August I got the current job that I’m working in as an admin manager. [I] started off as receptionist. I do the lot, it’s a small company, a flying school charter company. I happen to be the president of the Indian Association in this area. We have social gatherings and I organise that. So that’s been my story in the 24 years since coming to Australia. 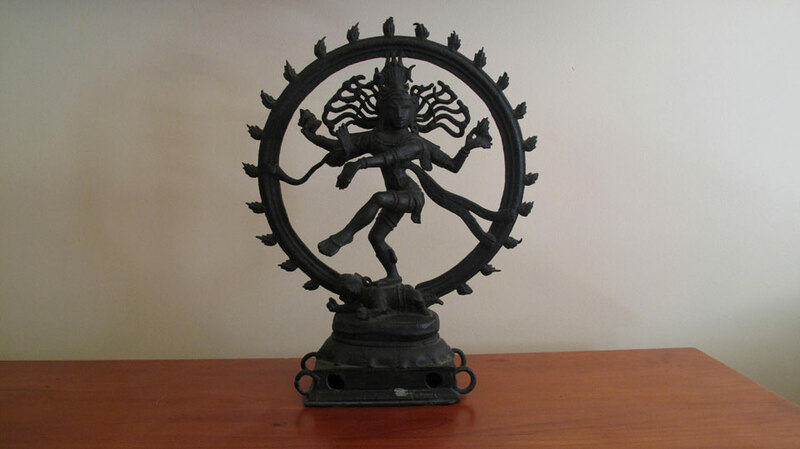 This is called ‘nataraja’, or dancing shiva. It’s in the family of my father-in-law. I don’t know exactly how many years old it is but it would be a couple of hundred years old. It’s a family heirloom that came a couple of years after we came here. We couldn’t bring it with us but after my father-in-law passed away, we were wrapping everything up over there so this came along, with a few kitchen utensils etc that I couldn’t bring with me when we first came. Our family, my mother in law, used to worship our spiritual master Sai Baba. He was alive until a year ago. Last year April  he passed away. His teaching is basically ‘Unity of Faith’, so I believe in all religions even though my religious background is Hinduism. We do celebrate all the Hindu festivals, which are mostly religious in nature, but we also celebrate Christmas. This is the first year actually that I haven’t had a Christmas tree because I’m very tired after my daughter’s engagement party and didn’t put one up. But normally we have a Christmas tree and celebrate Christmas as well. So I do believe in all religions and this is basically what our belief system is. That symbol there is the world’s major religions: Hinduism, Buddhism, Zoroastrian, Jewish, Islam and Christianity. And that’s framed with the five human values, which is what I believe in and follow and which is what Sai Baba propagated all those years. My mother-in-law was a great follower of his. My Dad actually did a painting of Sai Baba and presented it to my mother-in-law, which I now have. This is also one of my Dad’s paintings. 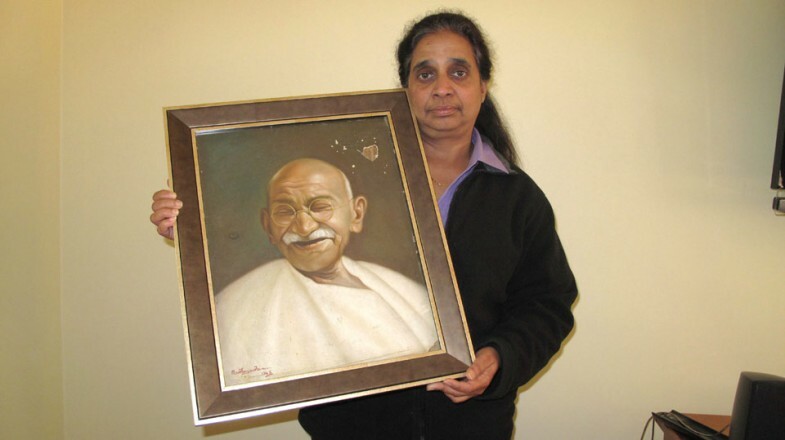 He was an artist and this is Gandhi’s painting done in 1948, the year that Gandhi passed away. It’s an oil painting. My father taught painting at a fine arts college, now it’s a technical university. He used to be quite well known in India. This was done in 1948 and it’s got a bit of water damage that I need to restore, but at the moment it’s sitting in a frame quite safe. It didn’t have a frame when we brought it here. Padma Ayyagari was interviewed on 19 December 2012. Filming, editing and photography by James Gallimore. Film transcription by Catherine Phelan. Web layout by Annette Loudon, NSW Migration Heritage Centre. Heritage Centre and Albury City.